Step into the world of restless ghosts and earthbound souls who have not yet found a peaceful reunion with Spirit. Their personal stories will touch your heart and awaken your soul. Discover why they are here, and share in their lessons of love, communication, and forgiveness. 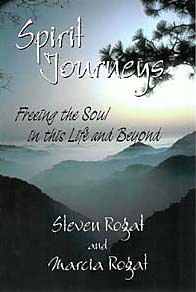 Join Steven and Marcia Rogat as they communicate with the dead, dying, and terminally ill, helping souls free themselves and move on toward more life. Learn how you, too, can connect with spirits and gently guide them toward completion. Whether searching for peace with those who have already passed on, helping loved ones prepare to make the transition, or seeking guidance along your own journey, these encounters will open a pathway toward healing and inner peace. Spirit Journeys is a book of comfort, hope, and inspiration, offering direction and encouragement to anyone seeking a greater awareness of our enduring connection with Spirit. Read sample pages from Spirit Journeys. Those wishing to make a payment by check or money order are invited to contact us via email. Retail stores, wholesalers, and large orders, please contact us via email for more information. Available at your local bookstore or online at Amazon. Also available on Amazon Kindle entitled Ghosts in the Mist: A Healing Dialogue with Spirit. Explore other books from Creative Thought Press.